Required percentage in graduation to appear in MAT? Percentage requirement in graduation for MBA and M.Com? 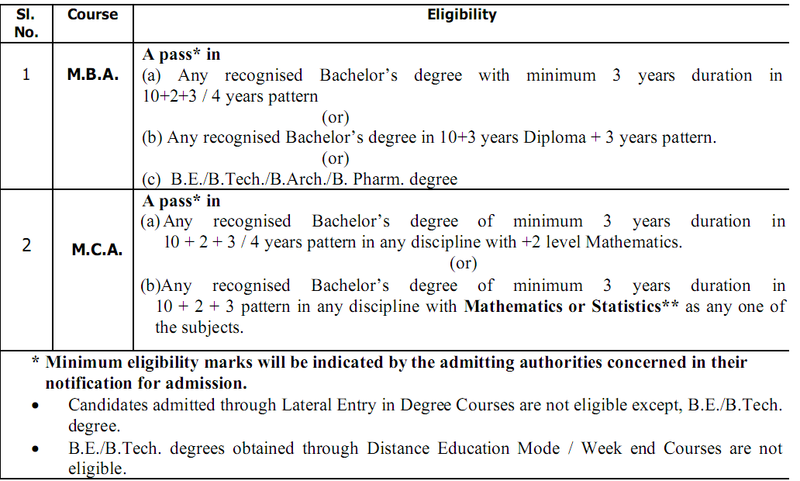 Minimum required percentage marks in graduation to pursue MBA? Minimum required marks in graduation to do MBA from IIM? How much percentage is required to do MBA? Required percentage in graduation to appear in GMAT? Re: Percentage required in graduation for MBA? There is no AGE CAP to apply to the CAT exams. SNAP- Conducted by Symbiosis, Minimum Eligibilty is Graduation pass with minimum 50% marks. CAT is a tough exam so prepare well before going for the exam. IT is on objective type of exam and if you want to qualify them then focus on Maths, English Reasoning Gk etc. AN all India level ranking will be made after the exam and only top students will get the privilege to study in the top and best college of the country. If you do not have much percentage then you take admission through Management quota but in this case you have to pay twice or thrice the actual fees. FOR PURSUING MBA , IT IS OBVIOUS THAT YOU NEED TO TAKE ENTRANCE EXAM LIKE CAT, MAT, GMAT, SNAP, XAT, and there are many MBA entrance exam , but CAT, MAT, SNAP, XAT , is quit popular among all of these MBA entrance exam . Aspirants needs to secure 50 % in their Graduation in any stream from recognized college . If one has the educational qualification then yes , then can easily sit for an CAT , OR MAT or any MBA entrance exam . So if you have 50% in your Graduation then apply for MBA entrance exam. HOPE YOU HAVE GOT THE ANSWER . 2.5% relaxation for SC/ST catagories. Take Entrance Exams like CAT, MAT, GMAT, SNAP, XAT, and there are many MBA entrance exam , but CAT, MAT, SNAP, XAT , is quit popular among all of these MBA entrance exam . Aspirants needs to secure 50 % in their Graduation in any stream from recognized college . If one has the educational qualification then yes , then can easily sit for an CAT , OR MAT or any MBA entrance exam . So if you have 50% in your Graduation then apply for MBA entrance exam. Common Admission Test or CAT as it is considered as the gold standard in MBA entrance. 1. A graduate degree from a recognized university. 2. 50% or above marks in graduation for general candidates. 3. For ST/Sc candidates 45% marks in graduation. For doing MBA minimum 50% marks required for General category. For other categories 45% marks are required. As you know that MBA is the post graduation course which is done after graduation.So graduation is must for MBA as everybody knows.So you must have completed your graduation to do MBA. MBA stands for masters in business administration and it is done after graduation in any field.So you can apply for MBA after every type of field in graduation.So you are eligible for it. But one thing keep in mind that the percentage requirement for MBA for general category is 50% marks and for SC/BC category the percentage should be 45% .So you have to follow this eligibility criteria. You must have completed your graduation with more than 50% only then you are eligible for MBA.You can also go for various other courses which depends upon your graduation stream. 2.For 45% of sc/st catagories. 50% marks in graduation is needed for the admission in this course. The eligibility of this course is as below--->>. The minimum percentage must be 50% in her/his graduation degree course. And of the best reason tp chosse this course is ege criteria,there is noo age criteria in this course. It means there is no limit for age. How much percentage is needed in CAT for best B-School? Does percentage of 10th and 12th matters in the admissions of MBA through CAT? Elite colleges of India with 95 percentile in CAT? How much percentage is needed in CAT for admission in KUK campus? All times are GMT +5.5. The time now is 02:19 PM.